Crittall raises the bar by outfitting all 11 floors of the Crosby Street Hotel with 54 of their popular W20 series windows. Located in the heart of New York’s vibrant SoHo neighborhood, Crosby Street Hotel is positioned on a quiet cobbled street where it is surrounded by a mixture of contemporary and modern styled lofts. With a goal of matching the high ceilings and style of the surrounding area, a decision was made to go with an argon filled, double glazed, 24-pane configuration with a center pivoting 4-pane operable unit. This particular configuration enhanced the luxurious style of the interior and exterior of the building, and provides great overall thermally efficiency. The dark powder coat finish on these frames also maintained the buildings dramatic, industrial appeal without sacrificing any structural integrity. Through utilizing Crittall’s W20 series, it provided the ability to deliver extremely slim sightlines and maximum glazing area allowed for access to the greatest amount natural light which was a key feature and goal in this project. The slim sightlines were also a perfect match to the surrounding buildings and accented the rustic brick exterior of the hotel flawlessly. 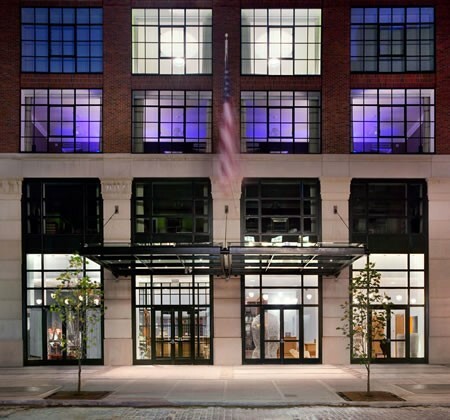 Looking back on the history of this once abandoned parking lot, transformed into a stylish luxury hotel, truly shows the versatility and stylish capability of the Crittall W20 series frames. If you are considering renovating your home, apartment or commercial business and are looking for a stylish, durable and efficient solution, let Steel Windows and Doors USA help you along the way.